I have to admit that when I started homeschooling that I was overwhelmed. Over the years I have learned some tricks that have saved me time. Now I can do what is on my list and still have some time for fun. The key to finding time is to determine what the most important things are. For me my relationship with God is first on the list. I need to spend time reading the Bible and prayer every day. Next I need to spend quality time with my family. Each of us needs to know that we are on the same team. We need to know that we like and support each other. We can do this by spending time together. After our relationship with God and family we can start to educate our children. Why is homeschooling the third step? Well if we are seeking God’s will we will know if homeschooling is right for our family. Also if we already have a relationship with our family then educating our children is easier. 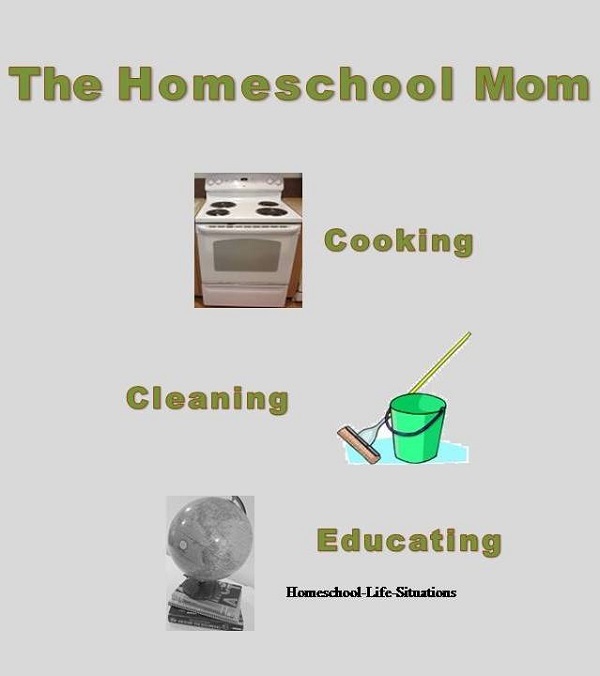 When you are a homeschool mom chores can seem overwhelming. We have family members at home all day long. The house can never seem like it is clean. I have found out that there are only three chores that need to be done on a daily basis. We need to eat, have clean clothes, and keep the garbage and dirt out. You need to eat so cooking is a first priority. We need clean dishes to eat off. So I have someone responsible for washing dishes. I would also include wiping counters and the table. Also remove garbage from the house. Next we need some clean clothes to wear. So do laundry regularly. If time is an issue, don’t folded or put away the clothes. Although everyone in the family needs to know what items are clean and what is dirty. Then when time allows we need to do some cleaning. I like clean floors so I try to have the floors swept and vacuumed several times a week. I also like a clean bathroom. One thing that I did when my children were young was teach them to cook, clean house, and do laundry. At first teaching takes some time. When children have learned the skills make them responsible for doing some chores. When other family members are responsible it free mom up for doing other things like having a home business. As a homeschool mom I am always looking for meal ideas that are inexpensive and do not take a lot of time to make. Times saving meals are good for busy days. Sometimes we get home late in the afternoons from errands or field trips. For taco soup, defrost a pound of hamburger and cook. To the hamburger add a large can of diced tomatoes, salsa, corn, and pinto beans. Serve the soup with tortilla chips, sour cream, and cheese. A similar soup is tortilla. Heat a can of refried beans, drained black beans, corn, and salsa up in a saucepan. Then serve with cheese, tortilla chips, and sour cream. To make chicken noodle soup use frozen tortellini, chicken, garlic, and chicken broth. When the soup is hot I add Parmesan cheese. In the spring and summer we eat salads and sandwiches. We also grill a lot. I also make a lot of meals in the slow cooker. Most recipes take between four and six hours to cook. I usually place everything in the slow cooker during lunch preparation. Some families like to cook once a month and place the items in the freezer. We did not like the casseroles that I had made. I do keep easy to use meat in the freezer. I buy ready-made hamburger patties and chicken tenders. There are even some time-saving tips for homeschooling. Planning can save us time. We at least need to know what supplies we need for the upcoming lessons. Then we do not have to rush to the store at the last minute. We can also teach our children independence. We have used curriculum that is self teaching. It is possible for the busy homeschool mom to get important tasks done.